On 25 June 2013, in a televised address to the nation, Qatar's Emir Sheikh Hamad bin Khalifa al-Thani announced that he was stepping down and transferring power to his son, Sheikh Tamim bin Hamad al-Thani. Sheikh Hamad bin Khalifa al-Thani had said the transfer was part of a ushering in a new era of young leadership for the country. Nearly two decades after accession to power, by June 2013 the emir of Qatar, Sheikh Hamad bin Khalifa Al Thani, was set to hand control of a transformed country to his son and heir apparent Sheikh Tamim. Taking the reins was the emir's fourth son, Sheikh Tamim bin Hamad Al Thani, who in recent years has become deeply involved in Qatari decision-making. Sheikh Hamad bin Khalifa Al-Thani became the new Emir of the State of Qatar on June 26, 1995, continuing the rule of the Al-Thani family that began nearly two centuries ago. Shaykh Khalifa ibn Hamad Al Thani, took control of the country when the leading members of the ruling family decided that Khalifa's cousin, Ahmad ibn Ali Al Thani, should be replaced because of his many shortcomings as amir. Sheikh Hamad, then the crown prince and defence minister, took power in 1995 while his father was on an overseas trip. He became the ruler of a country with an $8bn economy, a figure which grew to $174bn a decade and half later. The growth came largely from natural gas; Qatar possesses some of the largest proven reserves in the world, but produced almost nothing before 1995. As supreme commander of the armed forces, Khalifa ibn Hamad issued a decree in 1977 appointing his son and heir apparent, Hamad ibn Khalifa Al Thani, to the post of commander in chief. The same decree created the Ministry of Defense and named Hamad ibn Khalifa as minister. Hamad ibn Khalifa was a graduate of Sandhurst and had attained the rank of major general. Sheikh Hamad Bin Khalifa Al-Thani, Emir of the State of Qatar, acceded to power on 27 June 1995. Hamad Bin Khalifa Al-Thani was born in Doha in 1952. He received his Primary, Preparatory and Secondary education at Qatari schools, and joined the Royal Military Academy, Sandhurst, and graduated in July 1971. He joined the Qatari Armed Forces in the rank of Lieutenant Colonel and was appointed Commander of the first Mobile Regiment, now named: Hamad Mobile regiment. He was then promoted to the rank of Major General and was appointed Commander-in-Chief of the Armed Forces. Modernizing existing units, equipping them with the most up-to-date weaponry, increasing their personnel and providing the best training on the most advanced military techniques. On May 31st 1977, Appointed Heir Apparent and Minsiter of Defence. Appointed Chairman of the Higher Council for Planning, which is considered as the cornerstone in the building of a modern state. Chaired the Higher Council for Youth Welfare (HCYW) since it was set up in 1979 until September 1991, and pledged a lot of patronage to sports and youths activities through the HCYW, clubs and various sports establishments. H.H. the Emir is the sponsor of civilian sports in Qatar. He also established the first Military Sporting Association, which got the membership of the International Military Sporting Association. H.H. the Emir gave much support and attention to youth and sports sector out of his belief in the significance of the role played by this vital sector in the process of building and developing the society. 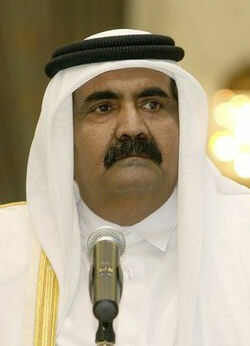 The Qatari Emir, Sheikh Hamad bin Khalifa Al Thani, survived an assassination attempt in Qatar's capital, Doha. According to Egypt's al-Fajr newspaper, unknown gunmen attacked the Qatari Emir's motorcade near his palace on 05 September 2011. The Egyptian newspaper said Sheikh Hamad has reportedly been injured in the attack and was taken to hospital, adding that eight of the Emir's bodyguards were killed in the incident. Al-Fajr says a media blackout had been imposed on the incident with Qatari officials refusing to comment on the incident. The growing natural gas wealth and media clout allowed Qatar, a country with less than half a million citizens - and less than two million residents - to develop into a major player in regional politics. During most of Sheikh Hamad's rule, Qatar adopted a progmatic policy, cultivating relationships with countries and groups across the political spectrum. Sheikh Hamad pushed several prestige projects, including Al Jazeera, the Arab world's first satellite news channel, and Qatar Airways, which was relaunched in 1997. He maintained close ties with the United States, which for decades has flown warplanes from a military base in Qatar. But he also built cordial ties with Iran, which most of Qatar's neighbours regard as a serious threat; the two countries share control of the world's largest natural gas field. The Qatari capital played host to a range of peace talks and negotiations: between Sudanese rebels and president Omar al-Bashir; warring parties in Lebanon; as well as Fatah and Hamas, the long-divided Palestinian factions. The Arab Spring brought a more prominent role for Qatar. Hamad backed the NATO-led military intervention in Libya, which helped to depose Muammar Gaddafi, sending a handful of Qatari planes in support. But his government also defended Bahrain after it cracked down on protesters, and announced that it was sending troops to support the Gulf force that suppressed the country's uprising in 2011. Qatar also emerged as a strong supporter of the rebels in Syria, despite the emir's efforts, just a few years earlier, to cultivate ties with Syrian president Bashar al-Assad. The Nile Sash, Egypt 1976. King Abdul-Aziz Medal, Saudi Arabia 1976. Diagam Tanda Kehormation, Indonesia 1977. Order Francisco de Miranda, Venezuela 1977. Knight Grand Cross of the Order of St. Michael and St. George, UK 1979. Grand Officer de la Legion d'Honneur, France 1980. Al Muhamadi Medal, Morocco 1981. Sash of Merit, Lebanon 1986. Al Hussain Bin Ali Necklace, Jordan 1995. Medal of Merit, 1st class, Sultanate of Oman 1995. Medal of 7th November, the highest decoration in the Republic of Tunis 1997. Grand Croix De La Legion D'Honneur, France 1998. Ordre National du Lion, Senegal 1998. Nishan-i-Pakistan, the highest decoration in Pakistan 1999. Ordinul National Steaua Romaniei, Romania 1999. The National CEDAR Medal of the Order of the Greatest Sash, Lebanon 2000. Cavaliere di Gran Croce, Italy 2000. Order of Republic, Yemen 2000. Order of Jose Marti, Cuba 2000. Al-Mohammadi Medal, Kingdom of Morocco 2002. The IAAF Golden Order of Merit, " H.E Shaikh Jassim bin Thamer Al Thani receives on behalf of H.H. The Amir, The Golden Order of Merit ",The International Association of Athletics Federations 2005. White Rose of Finland, Republic of finland 2007. The Grand Cross of the Order of the Redeemer, Greece 2007. The Grand Cross of Merit, Dominican Republic 2008.